There are two types of Game of Thrones fan. Those who make the daily run to Reddit to check whether the season eight script has leaked yet, concocting fan theories in the absence of actual facts, and those who run away with their hands over their eyes screaming about spoilers and nothing being sacred anymore. For the latter, you might want to look away now, because Maisie Williams, who plays young Arya Stark, had something to get off her chest and it’s out to ruin your day – April 1, incidentally. Appearing on The Tonight Show Starring Jimmy Fallon, conversation with the newly pink-haired actor quickly turned to the imminent fate of the characters currently in the running to sit on the Iron Throne and she took the trolling to a whole new level. Now, this has been addressed by a number of cast members before. If you remember, the script of season eight left Emilia Clarke – otherwise known for playing the stoically strong Mother of Dragons – wandering the streets of London and turning to alcohol to deal with the shock. Meanwhile, when Liam Cunningham was asked who survives the Great War he simply replied, ‘Valar Morghulis‘, which isn’t a great sign for anyone, really. 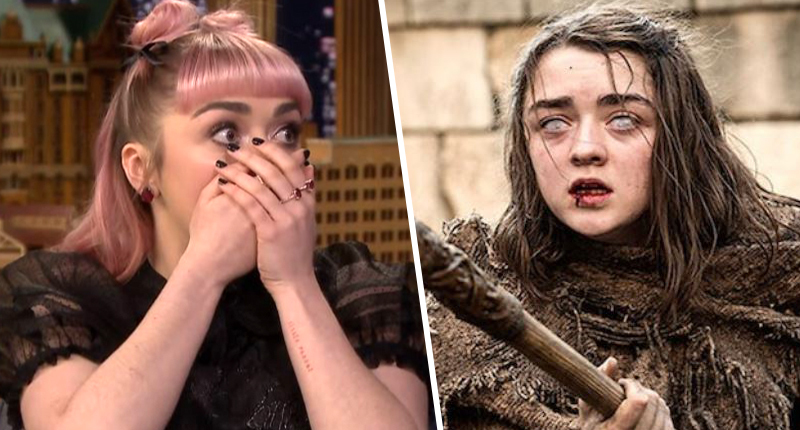 As fans remain hopeful their favourite will not fall in what’s set to be the biggest battle in TV history, Williams came out with a little tease of Arya’s fate on the chat show yesterday. The 21-year-old told Fallon she decided to ‘keep a tight lip on everything’ as ‘HBO have sent out a lot of memos recently about just saying nothing’, before adding, ‘they would absolutely kill me’. The audience gasped, Maisie started to tear up, her hands shaking, and Fallon looked genuinely concerned as the actor begged for what she said to be edited out. But the scene got too much and she walked off stage saying the interview couldn’t continue. …Until the little rotter popped back from behind the curtain on stage left, declaring it was an April Fools joke all along, demonstrating acting sure to get her more jobs at HBO. Game of Thrones season eight is coming to a screen near you on April 14 on HBO.